The European Union Chamber of Commerce in Korea (EUCCK, www.eucck.org) is pleased to announce the election of Mr. Hans-Bernhard Merforth, Chief Representative of Commerzebank, as the new Vice-President of the Chamber. Mr. Merforth is the representative of Germany on the EUCCK Board of Directors, and will replace Mr. Peter. F. Thewlis as Vice-President. He has been associated with Commerzebank- one of the leading banks in Europe- since 1979. In this capacity, he has spent a considerable period of his career in Korea, having been the Senior Vice President and Executive Director of Korea International Merchant Bank from 1990 to 1996. He held the position of Senior Managing Director, Korea Exchange Bank, from 1998 to 2003. 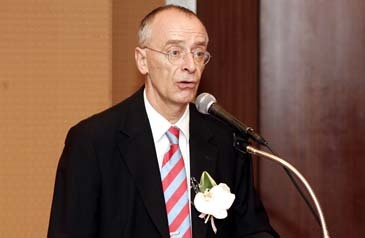 Mr. Merforth has been the Chief Representative of Commerzebank in Korea since August 2004. Mr. Jean-Jacques Grauhar, Secretary General, EUCCK, welcomed Mr. Merforth's election and said that his rich experience should provide a positive impetus to the chamber in fulfilling its primary objective of strengthening ties between EU companies and Korea. The European Union Chamber of Commerce in Korea, a non-profit organization, is made up of around 800 members from the EU, local as well as overseas business community. The purpose of the Chamber is to help in any possible way to develop trade, commercial and industrial relations between the EU and Korea. It paves the way for and fosters contacts between interested business circles of the 25 EU member states and the Korean peninsula.